Four men who allegedly snagged millions of concert and sports tickets with an elaborate computer scam will have to defend themselves against federal prosecutors. A 43-count indictment was handed down on February 23 and unsealed today, pinning the scam on Kenneth Lowson, 40, Kristofer Kirsch, 37, and Faisal Nahdi, 36, all of Los Angeles, as well as Joel Stevenson, 37, of Alameda, California. They face conspiracy to commit wire fraud and to gain unauthorized access to computer systems, plus 42 counts of wire fraud, gaining unauthorized access to computer systems, and causing damage to computers in interstate commerce. The men allegedly enlisted hackers and used a network of computers to trick Ticketmaster and other Web sites into thinking all the purchases were coming from humans. They even managed to stump the "Captcha" tests where you have to copy obscured words into a text field to prove you're not a robot. These methods allowed them to evade the sites' purchase limitations. 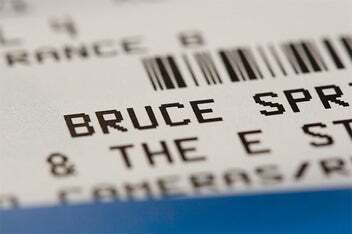 The indictment claims that the defendants bought more than 1.5 million tickets overall to concerts and sporting events, including 440 tickets for a July 2008 Bruce Springsteen concert. Then, they allegedly resold the tickets to brokers, sometimes for $1,000 more than face value. I want to be really mad at these guys, if they're found guilty, because high-demand tickets can be so hard to get, and it's frustrating when those same tickets almost immediately appear on resale sites such as StubHub and TicketsNow. But I know they're just gaming a system that's already broken to begin with. It's not as if federal prosecutors are trying to shut down scalping. If these guys go to jail, you'll still be forced to spend $500 to see Springsteen because you couldn't get into Ticketmaster the moment the tickets went on sale. And you'll buy those resold tickets at TicketsNow, which Ticketmaster owns. Even Ticketmaster's hands aren't clean, recently settling a case with the Federal Trade Commission where the site allegedly funneled people to TicketsNow without being clear about the difference between sites. I suppose it's good that there may be fewer sets of hands grabbing up all the concert tickets, but don't expect much to change.